The Stromung System for the E30 M3 is probably the 'smoothest' sounding system/muffler for the E30 M3 we have heard. A lot of systems are on the loud side and the Stromung E30 M3 system has a very deep and mellow sound that we just love. Something like stock but a little meaner and a little louder. This excellent control of volume makes it a great match for a VSR, Supersprint, or VAC center section, as they tend to be too loud for most when fitted with most aftermarket mufflers. Affordable and handsome, it's a great looking and sounding system. The Borla used to be the best bang-for-the-buck rear section but the Stromung eclipses it on all levels. Fitment is also superb, being made in the USA with care, each Stromung locates nicely in your rear bumper cutout and has stepped inlet piping for flexibility of install. Slips on to factory center-section pipe with no cutting or modifying needed, or the included step down can be trimmed to fit large diameter race center sections as well. 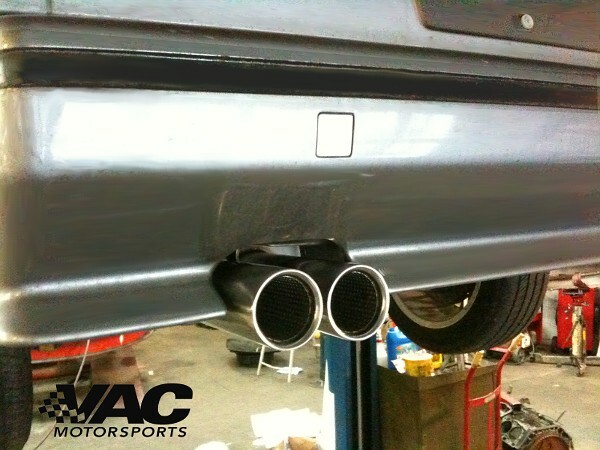 Click image for a better view of the E30 M3 muffler and tips. The sound deadening potential of the Stromung matches great with high flow center-sections without being too loud. Please note: As a leader in E30 M3 performance, we try and stock these systems at all times for your ease of ordering! When sold out, they may take 1-2 weeks if out of stock. Please check with us on stock if necessary. From A. Chan of Fresh Medows, New York on 5/15/2009 .